Born in the heart of Australia’s most heralded wool growing district, Emu Australia has always been at the soul of what makes their footwear legendary. As the producer of the world’s most quality Merino wool and sheepskin products, their brand is inspired by unique, natural elements. Just like an emu, this company can only move forward. For more than 15 years, Emu Australia has been operating out of their home of Geelong. Since the beginning, when they began producing boots, it has been a family affair. The very first ‘ugly sheepskin boot’ was produced back in ‘70s and while they were highly functional, style was not a very prominent aspect. Fast-forward to the founding of Emu and you will find the same employees and their families working to perfect the product. Inspired by Australia’s national bird, Emu draws upon similarities with the indigenous creature such as resilience, resourcefulness and the ability to stand tall and proud. While everyone else may be talking about the boots with the fur, it’s really all about the boots with the wool. Loaded with style and comfort for the ladies, Emu Australia boots like the Paddington Hi not only look good, but do so much more for you. Crafted from water resilient double-face sheepskin, the Paddington Hi naturally wicks moisture away while remaining odorless. Vintage leather and suede branding team up with double stitched seams to amp up the durability for a long lasting experience. Even with the Angels Lo it’s impossible to go wrong as these buckle-adorned beauties employ a removable sheepskin lined sole that is anatomically correct as well as an EVA enhanced outsole for delicious comfort. Is there anything better than a sweet pair of slippers? Nope. Dudes can sink their toes into the robust Emu Australia Bubba Slippers. Rugged double stitched seams crank up the strength of these bad boys and a super durable Aussiesole made of tough rubber enables you to venture outside to do manly things like take out the trash. Now, with the Bubba Slippers, all you need is a robe, pipe, and monocle to complete the look. 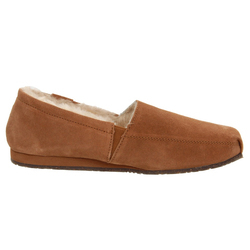 Ladies, channel your inner Sacagawea and lead the way with the Emu Australia Talia Moccasins. 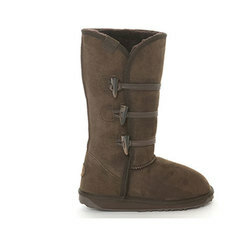 Premium sheepskin and suede unload luxurious comfort all over your feet whether you are going out to grab the mail or kicking back by the fire. It’s easy to get tired of flimsy sandals that do nothing but fall apart at the most inopportune moments. So, Emu Australia did something about this atrocity that happens with far too much frequency. For long lasting style and comfort, the Women’s Rye Sandal combines crazy soft leather and dreamy wool for an open toed experience unlike any other. For the men, the Peterborough Sandal is one prime slice of action. Soft, premium leather straps compliment the hand stitched toe post, while a dual compression layered sole explodes with comfort. When it comes to performance quality infused with timeless style, Emu Australia has become a footwear authority that has no intention of fading away.